ISLAMABAD — Pakistan says high-level discussions “away from public glare” are under way with the United States to bridge differences stemming from the new Afghan strategy U.S. President Donald Trump announced in August. 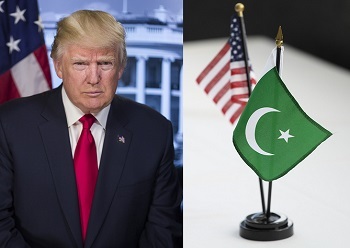 Pakistan did not agree with the U.S. policy because “there was a difference in understanding and perceptions on both sides,” said Foreign Ministry spokesman Mohammad Faisal Thursday, while discussing the dialogue process at his weekly news conference in Islamabad. The policy focused on Pakistan’s alleged duplicity; receiving billions of dollars in U.S. assistance as a non-NATO ally for combating regional terrorism and covertly supporting the Taliban and the Haqqani terrorist network waging deadly attacks on Afghan and U.S.-led allied forces in Afghanistan. Islamabad promptly rejected the accusations, saying the country is being scapegoated for U.S. military failures in stabilizing Afghanistan and defeating the Taliban. “Pakistan and the U.S. are actively engaged in discussing the situation in Afghanistan with a view to arriving at a better understanding of each other’s positions and to devise the way forward, to promote peace and stability in Afghanistan,” Faisal said. The spokesman also said U.S. Defense Secretary Jim Mattis will continue the interaction during a trip to Islamabad. He did not say when, but the Pentagon chief will be visiting the country on December 3, according to Pakistani Foreign Minister Khawaja Asif. The Pentagon has not confirmed the date. U.S. officials are also critical of alleged ties between the Pakistani spy agency, ISI, and the Haqqani network, whose leaders are accused of directing violence in Afghanistan from their alleged sanctuaries in Pakistan. The top U.S. military commander in Afghanistan, General John Nicholson, on Thursday told reporters Washington is in talks with Islamabad to press the latter to cut those ties. “This is a conversation that is going on between Washington and Islamabad at the highest levels of the U.S. government. So, I would not talk about the next steps that we will take. But you can be assured that my government, the United States, is putting pressure on Pakistan, this is diplomatic pressure, economic pressure,” Nicholson said. The U.S. general cited a deadly truck bombing he said the Haqqani network plotted in the high-security diplomatic zone of the Afghan capital, Kabul, in May of this year. The attack left more than 150 people dead and many more wounded. Embassies of nine countries were also damaged, according to Nicholson. “They [the Haqqanis] are not only attacking innocent Afghan people, they have also been attacking the international forces and diplomats that are here to help the Afghan people. So, all of these nations have been going back to Pakistan,” noted the general. Pakistani officials maintain that their counterterrorism efforts have reduced the threat in the region and the country is not supporting any warring faction in Afghanistan. Pakistan says camps set up for millions of Afghan refugees have been used as shelters by insurgents to plot attacks on both sides of the border. Islamabad does not rule out the presence of Afghan insurgents on its side. They say unleashing a counter-militancy operation on the displaced population would amount to bringing the Afghan war to Pakistani soil at a time when the country is already fighting anti-state militants. Critics, however, rule out a total collapse in bilateral relations over persistent tensions. They point to major ground and air lines of communications through Pakistan that have been used for years to send supplies to thousands of U.S. and NATO forces in Afghanistan. Alll along they have exercised the savageries with impunity and got exoneration from goofy highly-paid judges who were suppose to raise their honest voices.international. It is set at a desperate junction with no proper exit routes for the invaders to save face. JUST SPOLAGIZE AND GET OUT OF AFGHANISTAN! *Pakistani puppet did did their best; I guess, it has not been good enough and never will be. * We must collectively command a cessation to all hostilities and an end to this savagely-conducted “INTERNATIONALLY-IMPOSED CONFLICT” in Afghanistan. * BROTHERS AND SISTERS ! I am not a “Darwashe”; even tough I try a little. I am not a pious hermit (Darwaish); even tough I try a little (here and there). I am not crazy; even though, I may have lost some of my wits (memory).